In addition to religious trappings common to the temples of many lands and gods — like altars and deities’ holy symbols — certain objects, furnishings, sacred animals, and other items of a ritual nature might be found only in the shrines of specific deities or pantheons. Relics also often have very narrow functions and are frequently affiliated with specific cults or sects within a temple, such as those that might use the item in question as part of secret rites in hidden areas. Depending on their uses, such items might either be in plain sight or concealed in special areas. 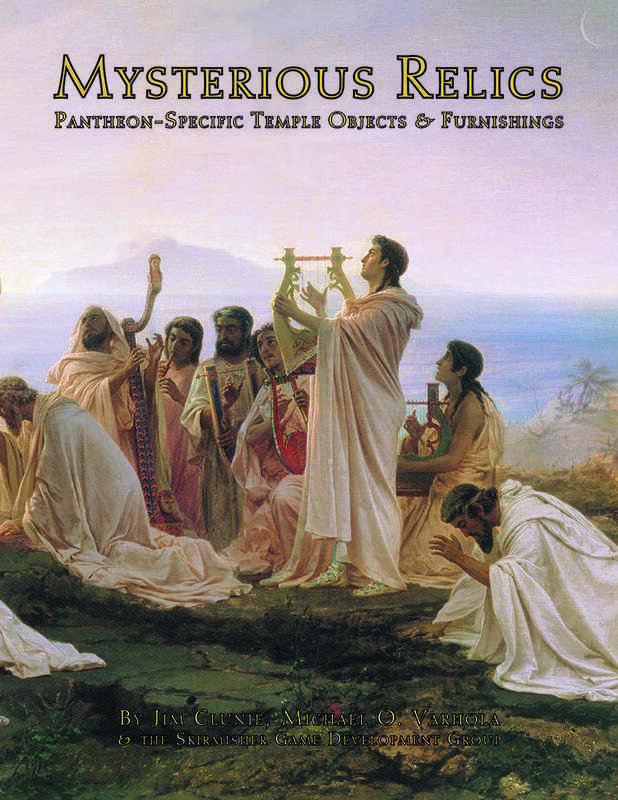 “Mysterious Relics” examines the various objects, furnishings, garb, accouterments, and items associated with temples and other holy sites and provides as examples a dozen ancient holy items associated with the classical Olympian deities. Descriptive text and three sidebars can be used for any fantasy role-playing game, and 4th Edition Dungeons & Dragons stats for the holy items can be easily adapted to OGL-based RPGs or extrapolated from and used in other games altogether.